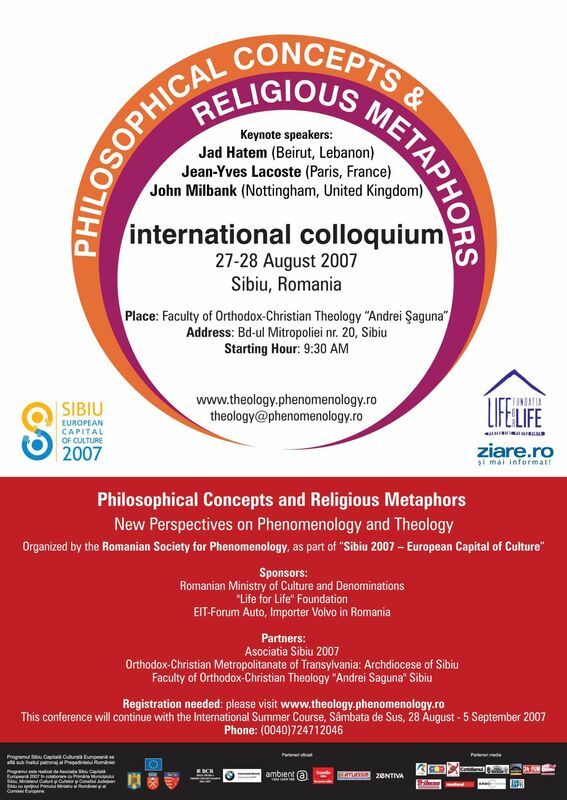 It is rather obvious that the relationship between phenomenology and theology is one of the most debated topics in the field of Continental philosophy: from the Husserlian investigations of the religious life to the Heideggerian discussion of the Sacred, from the “theological turn” of the French phenomenology (epitomised by E. Levinas, M. Henry, J.-L. Marion or J.-Y. Lacoste) to the ever-growing interest of contemporary theologians for the phenomenological method, the conceptual boundaries between these two “disciplines” have been continuously debated. Until today, this subject remains one of the most controversial and pressing dimensions of contemporary thought. The aim of this colloquium is to channel this debate towards new horizons, which will take into account different historical contexts. Sibiu, the Romanian city hailed as the European capital of culture for 2007, reflects a specific mixture of philosophical eccentricity and religious diversity. The event will gather together phenomenologists interested in life of the sacred and its multiple discourses, and Christian theologians who openly welcome the phenomenological and "post-metaphysical" understanding of being. Both types of scholars are called to reflect upon the commonalities of their endeavors, reflected by crucial concepts, such as the "gift", "revelation", “death”, "manifestation", "event." There are a number of questions that the participants at this Conference will try to address: how can phenomenology contribute to a better understanding of the religious life, in general? What are the limits of the phenomenological description, and of the hermeneutical enterprise, when it comes to a philosophical understanding of the sacred? What is the room left for the narrative within the world of noetic abstractions? Which are the major theological challenges met by those phenomenologists who, against the lures of relativism, still work under the classical presuppositions of universal rationality? Finally, which are the institutional outcomes of the encounter between phenomenology and theology, for the University space in particular, and the public forum, in general? Could a new understanding of politics, sociality or human personhood emerge after the cross-fertilisation between the word of faith, and the world of reason?